"A man can change his stars." As the two opponents in the medieval jousting contest ready for battle the crowd cheers with anticipation, the sound of We Will Rock You echoes through the countryside. Or picture this, a dance erupting at a dinner hosted by a ruthless Count, and instead of traditional music, the guests glide through the castle to David Bowie's Golden Years. Strange indeed, though each of these instances occur in director Brian Helgeland's A Knight's Tale, a motion picture that introduces new century material into medieval times. To be truthful, the basis of Helgeland's idea has merit. Take the things made popular in today's sporting arenas (the wave, loud-mouthed announcers, and trademarks) and introduce them to a time when they didn't exist. Though while the premise is intriguing, it feels out of place with the remainder of the picture, causing A Knight's Tale to seem more schizophrenic than entertaining. The knight referred to in the film's title is William Thatcher (Ledger), a peasant who dreams of jousting but lacks the necessary birthright of royal descent. His father sends him off to work for a jouster, and when his master passes William risks all by taking his place. Although he lacks the blood of royalty it isn't long before William is winning tournaments all over France. Just as no story is complete without a villain or a love interest, A Knight's Tale not surprisingly offers one of each. The villain is Count Adhemar (Sewell), a master jouster whom dresses all in black for those who doubt his bad guy status. The girl is Lady Jocelyn (Sossamon), a beauty whose affections are vied for by both Adhemar and William. What is disappointing about A Knight's Tale is its total lack of a central idea. From the beginning there is no doubt that William will get the girl as well as the jousting title, leaving little to ponder over the lengthy running time. Helgeland's picture would have worked better had he created some sort of conflict to keep the audience in suspense, even with the inclusion of standard sports film clichés. Yet paramount in the list of flaws for A Knight's Tale is the use of 20th century slang, but events of the 15th century. Had A Knight's Tale been done with these gags throughout I believe the movie may well have been successful. Sadly those moments are only peppered throughout the film, leaving the picture uneven, with Helgeland bouncing back and forth in tone from one time period to the next. A better film would have focused on either the situations or just the jousting, in A Knight's Tale the balance of both becomes detrimental to the success of the picture. 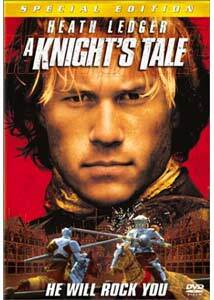 The largest area of success for A Knight's Tale is young Heath Ledger. As the film's protagonist Ledger is forced to carry the picture, and does so in a way that it is not surprising he is becoming one of the brightest up and coming stars in Hollywood. Ledger has a sort of charisma and self-assuredness that is frustratingly absent in many young stars, and in A Knight's Tale he uses his abilities to craft an interesting character. Several scenes that are heavy-handed and poorly written seem to work because of Ledger's performance. Another advantage to Ledger's performance is that in the 1400s there seemed to be a steady amount of hair gel available for peasants, thus providing William that prim and proper look that wouldn't be invented for centuries to come. Even after my second viewing of A Knight's Tale I am still left with the sense of mediocrity that I encountered upon exiting a movie theater last May. Much of the film is a rousing look at medieval jousting and love, but other moments seem lost among the ruins of a poorly written script. Helgeland, whose screenplay for L.A. Confidential is a textbook example of how screenplays should be written, has created interesting characters, though the script suffers from overkill. Image Transfer Review: While the film itself may have a few flaws, the same can not be said about the 2.35:1 anamorphic transfer that graces the DVD of A Knight's Tale. Aside from some small print flaws the image retains a consistent quality throughout. The muted colors of the villages and jousting matches look fine and the picture has terrific detail and sharpness portions. This is a wonderful transfer that offers little to fault. Audio Transfer Review: The Dolby Digital 5.1 mix provided for A Knight's Tale is easily one of the better mixes I have heard recently. Rather than offering a gimmicky mix the soundtrack for A Knight's Tale is enveloping, and more than just the action sequences sound terrific. In the quieter moments both ambient sounds and composer Carter Burwell's score come through cleanly from the surround speakers. The front soundstage also sounds quite nice with good separation as well as crystal clear dialogue. A French Dolby 2-channel mix is also provided. Extras Review: Leading off what is certainly a wealth of extra features is the screen specific commentary by director Brian Helgeland and actor Paul Bettany. While it is disappointing that the track doesn't focus on the technical aspect it is relieving that the two get along so well with one another. The chemistry between Bettany and Helgeland provides for ample amounts of humor that helps the listener forget about the fact that there really isn't much to learn from the track. Up next are 6 deleted scenes with introductions by director Brian Helgeland. Several of the sequences deserved their deletion though there are those that would also have fit well with the final cut. A 15-minute HBO First Look segment is also provided, and though it is largely promotional, it is certainly worth a look. Rounding out the behind-the-scenes aspect of the DVD are no less than a whopping 11 featurettes. Each short runs a brief 3 minutes and although it is nice to see how the film was made, the two segments that focus on Ledger and Helgeland respectively are unneeded. Rounding things out are a music video for the Robbie Williams remake of We Are The Champions, the theatrical trailers for A Knight's Tale and Final Fantasy: The Spirits Within, and cast and director filmographies. The DVD-ROM portions of the disc include a weblink to the Columbia TriStar Home Entertainment website as well as a screensaver for A Knight's Tale. Though my opinion of the film itself is best described as on the fence, this is one terrific DVD from Columbia TriStar. For fans of the film this is a no brainer when it comes to deciding on a purchase, but for the curious it is better suited as a rental.